This double columbine is a lovely flower growing in the wrong place. It's a lost seedling, far away from its parent plants which are clear across the yard in another flower bed. 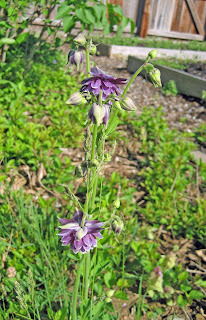 It is just one of my blooms that I'll be showing on my blog for Garden Bloggers' Bloom Day on the 15th of this month. Remember bloom day? The day to post on your blog about what is blooming in your garden, so that we can compare and contrast what is blooming in our gardens on the same day. And it's easy to participate. Just post about your blooms on the 15th of the month and then leave a comment on my bloom day post so we can find you. The reason this columbine is in the wrong place is because it is right in the middle of a low thicket of Forsythia x intermedia 'Arnold Dwarf'. I hacked this forsythia back to the ground last fall, fully intending to also pull it out, but time got away from me, it got cold and I left it for another day. This spring, this bed was still full of this forsythia. No winter miracle occurred to kill this plant. In fact, hacking it back last fall seemed to have increased its resolve to live. So I took matters into my own hands today. With the help of a grub hoe and one of those heavy duty hand tools that has a forked end and a straight end, I hacked back that forsythia, pried out as many roots as I could and reclaimed that bed for better plants. Here you can see the grub hoe and the hand tool in the cleared out bed, resting from their labors. The grub hoe isn't a tool I use every day or even every year, but it sure comes in handy when I have some hard grubbing to do, like today. There is no way I could have cleared this bed on my own without the grub hoe. I can raise this hoe up over my head and then slam it down beside a clump of roots. 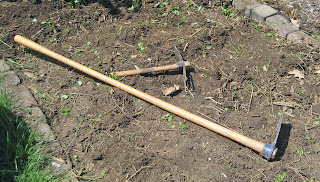 Then I pull back and forth on the handle, lever style, to work the hoe head under the roots and pry them out. I'm not that strong, but fortunately, the grub hoe is heavy duty and can do a lot of the work for me. Though I am pretty certain that the forysthia isn't going to grow back from what roots are left in this bed, I'm going to wait until fall before I plant anything "permanent" here. For now, I'll run a cultivator through this bed, smooth it out, add some compost and then sow some zinnia seeds. They'll be pretty this summer and should any forsythia roots send up a shoot or two, I can easily take care of them. Then in the fall, I can remove the zinnias and plant something new here. I did learn a lesson, again, from this mess. I learned that not all forsythia are "nice shrubs" and that plant tags often have hidden messages on them. Let me share the description on the tag, which I still have after ten years. "Early-flowering deciduous shrub with bright yellow flowers appearing in spring before leaves emerge. Very compact growth habit. Medium green leaves appear after blooms. Use as a hedge or in mass plantings." The last sentence should have tipped me off. Hedge? Mass Planting? Now I know this means 'suckers all over the place'. Oh, and the bright yellow flowers? This forsythia hardly flowered at all. Read plant tags carefully for these 'hidden messages'! And if you still aren't sure about a plant after reading the label, look up the variety on the Internet to get more information. It will save you in the long run from being disappointed and from having a lot of work to do to remove the plant when it isn't what you thought it would be. Bye, bye 'Arnold Dwarf', take your tag and don't come back. I have two better forsythia to enjoy, 'Gold Tide' and 'Show Off', so I don't need your kind, 'Dwarf Arnold' who barely bloomed in the ten years you were here. This fall, I need to be strong and 'take care of' some areas like you took care of your Arnold Dwarf Forsythia. I have no problem at all killing plants out of neglect...but yanking them out...it just hurts. It's so judgmental. I know, I'm a loon. I'll get over it. I uaed to use a mattock for things like this, but the grub hoe seems better balanced. This only reminds me of things I need to get done in my area. Hi Carol, HA to your message to Arnold f. He sounded good though on the tag, low growing and compact, perfect for a forsythia. Thanks for the heads up on his real personality. I like the thought of you raising that grub hoe over your head and bringing it down with a thunk. A good way to let those negative thoughts escape, better that yoga! What is left off the tag for Forsythia is this truth; "Forsythias' draping branches will touch the ground and in a blink root tip causing this shrub to increase its width by tenfold within moments!" Now that is another good idea! Aristolochia is running rampant as is Humulus (hops). Wish I could take those back! I just keep them hacked back. Who knows, I might want to make beer someday. Thanks for the Bloom Day reminder. I almost forgot! I'd say that giving a plant 10 years to produce before attacking it with the Grub Hoe was very fair of you. I don't know if I would have waited that long. 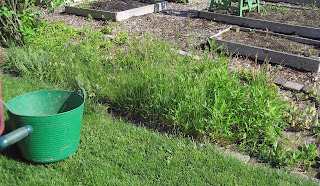 I always, always feel guilty cutting down, hacking out or destroying any living plant - even weeds. Next time you're over, I have a plant that I would like to see go bye-bye. Would you do the dirty work for me? Pretty please? I'll just wait inside and pretend I don't know what's going on out there in the yard - LOL! My rule of thumb is that if a friend offers to share divisions of a plant it is most likely to fall into that "vigorous" category. On the other hand, if I must fall to my knees and beg for it, it's a safer bet. Of course, if I see a plant in its one minute of fleeting glory, no amount of warning-off will deter me. Borage and Nigella are the two self seeders that have plagued me of late. Good riddance to bad rubbish; bye bye Arnold Dwarf I'm sure glad I never knew you! I like your idea of that list, a kinda gardener beware thingy. BTW we're having the pick axe out at the mo at Bliss, will show pics of that later. A grub hoe would not have done the trick.